Tonight when you’re lying in bed with your lover/puppy dog/teddy bear and something truly intimate slips out of your mouth, say, “When I was a child I dreamed of changing the world and now that I’m making money sometimes I wonder if I’m missing the real opportunity to help others,” ask: Would you want that whisper broadcast on television during the Super Bowl? Of course not. This is called media self-filtering, or the age-old habit of humans using different communication tools in different ways. This week we spoke at the Direct Marketing Association on how filtering is creating new challenges for advertisers, however, as more devices and portals give us greater self-filtering controls. What is self-filtering? 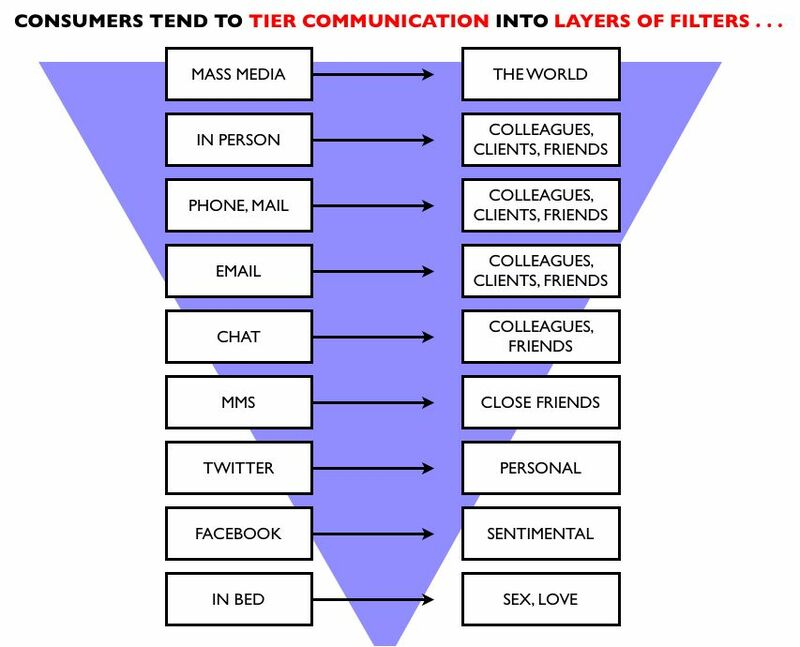 The graphic above shows how a typical consumer (me) “tiers” media from the most public space (mass media such as television or movies) to the most personal (under the bedroom sheets). Facebook is more intimate for me than Twitter, and Twitter is more intimate than email, and email more closed than the telephone. For each tool, I set up controls in terms of whom I connect with, who can access the stream, what I share inside it and what I choose to receive. You, and everyone else, does exactly the same. 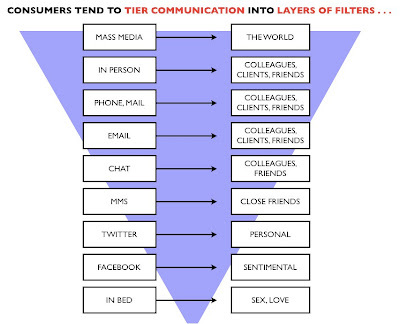 All of which creates a pinch for marketers, because the inventory for their messages or advertising gets squeezed out with every additional filter layer. Consumers are demanding more self-filtering control even as some media outlets seek to take filters off, creating huge pressure on businesses pushing memes in the middle. This week YouTube tipped its hat to consumer privacy concerns by launching new “unlisted” video controls, where users can post films and no one else can see them unless they have the direct URL link. Most media networks, though, have been moving in the opposite direction. Facebook has gradually made openness its default setting — attracting the wrath of Congress, privacy experts and analysts such as Jason Calacanis. 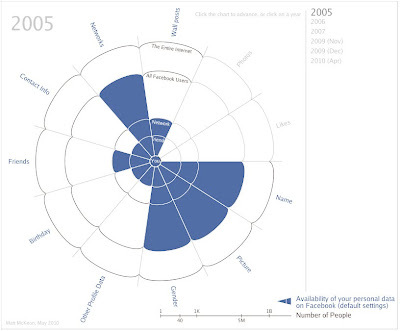 Matt McKeon, a developer at IBM Research’s Center for Social Software, has created a beautiful infographic of Facebook’s expanding openness / eroding privacy defaults over the past few years. Is this good or bad, beautiful or ugly? A Metcalfe student would suggest Facebook, like other networks such as Twitter, LinkedIn, Vimeo and your cell phone company with those deals to call friends for free, are opening their node connections to try to (a) increase the utility of the network for users while (b) collecting more data to support advertisers. 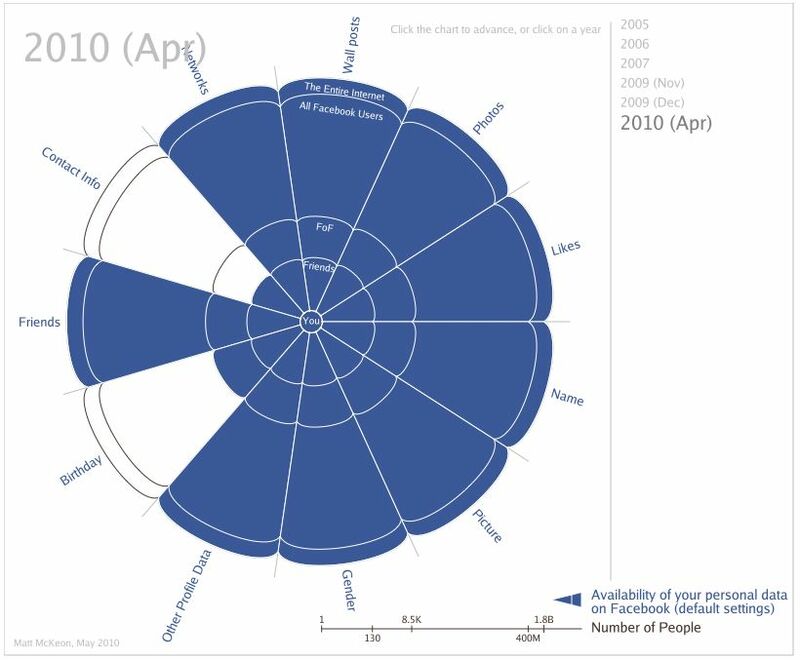 Calacanis in his critique suggests publishers are nuts to plug in to Facebook Connect, which bases the personalization of YourSite.com on the preferences monitored by Facebook. “If you’re stupid enough to give up your customer database to Facebook, (Mark Zuckerberg) will pay you back by screwing over your user’s privacy!,” Calacanis shouts. That is one harsh viewpoint. The alternative reality is simpler: Social networks, like businesses, are doing what corporate entities have always done — recognizing that customers are their most important asset and working hard to expand the data they can collect and manage on that asset. We suggested in our DMA speech that if Charlene Li is right, and social media does someday become like air, the connected nodes of humanity will form an aggregate data set more valuable than the current financial information that provides FICO scores or product-purchase observations that build mailing lists. Someone, somewhere will find a way to aggregate this information and use it for marketing purposes, because a society based on pleasure from consumption has a demand for better, more personalized products and services. It will be a bumpy road to get there, because just as consumers long for shiny objects, they fear outsiders peering into their souls. We want leather jackets but hate to measure our waists. The good news is now you can record your fears on film and post it quietly and privately to YouTube; just be careful about mentioning it in your Facebook News Feed. Via Make the Logo Bigger, @darrylohrt, and a homework assignment from The Beancast.